Denis Colin has always wished to share music – his music, jazz in particular – with as many people as possible. After more than forty years of hitting stages everywhere, he is committed to pass on his own experience as much as possible. He has been engaged for years in many cultural activities, in various forms, aiming at a wide and extremely varied audience. Planning and setting up musical actions is always done according to the reception team requests, expert of the concerned territory. During those two last years, living close to theatres allowed him to work in music schools and conservatories, amateur practice associations, schools, colleges, high schools and ‘maisons de quartier’*. Les Arpenteurs du Son, the association in charge of all his productions, is also registered as a training organisation. This allows him to work as a vocational trainer with music school teachers, ‘Intermittents du spectacle’* and ‘Dumistes’*. Since May 2013, Denis Colin is a graduate in somato-psychopedagogy, an approach which places the body at the heart of the learning process. – Music schools of all levels, multi instrument improvisation master classes, bass clarinet master classes, repertoire exploration. – Vocational training: multi instrument improvisation workshops intended for music teachers (CNFPT), overcoming stage fright course. – Amateur ensemble: compositions for harmony orchestras, ensemble sound workshops (working on their own repertoire), improvisation workshops, Nino Ferrer’s songs arrangements for choirs. – College and high schools: depending on the level of the student, study of the relation between music and cinema (movies concert creation, mise-en-place*/rehearsal included, animated film sound effects, cinema scenes sound illustration, etc. ), “Jazz à la cantine” workshop (introduction to jazz, pupils presenting jazz standards – which will be finally played by a trio), work with CHAM* according to the school project. – Workshop “T’écoutes quoi?”: commented listening and sharing of pieces of music favourite to each one. All audiences. A ‘maison de quartier’ is a municipality structure implanted in large cities suburbs, offering community services, social services and sociocultural activities. In France, an ‘Intermittent du spectacle’ is an employee – not a freelance worker – who works intermittently as an artist or a technician. The ‘dumiste’ is a musician who builds the child musical awareness through school projects – often in partnership with conservatories, orchestras and sociocultural structures. The ‘mise en place’ is part of the rehearsal. Its concerns the structural and rhythmic collage of instrument sections and/or choirs and/or soloists. 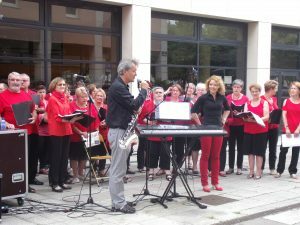 In a CHAM, a significant part of the school time is devoted to music. Students share their time between school and conservatory.